Vermont V.O. Pharmacy opened in 1992 and is family owned and operated. Additionally, we are an innovative complete multi-service compounding pharmacy in Los Angeles’ Korea Town. We can fill all your healthcare needs from the simplest to the more complex, from routine prescriptions to compounding pharmaceutical solutions for your needs, from wound care products to durable medical equipment, from orthopedic support wear to therapeutic compression garments. Our staff is trained to set the standard in patient care and pride themselves in attention to detail, especially when you need hard to find or discontinued products. To determine the needs of our patients, a close triad relationship between the physician, the patient and the pharmacist is crucial. Our staff works closely with the physician and patient to find solutions to individual healthcare challenges. At Vermont V.O. Pharmacy we want to help you solve your medication nightmares, not only with competitive prices, but also with the type of service you won’t find in many places. At Vermont V.O. Pharmacy, we think of our patients as part of our own family, not just as a prescription to be filled. The entrance to Vermont V.O. Pharmacy in located within our buildings parking lot. 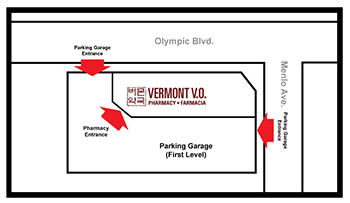 We're on the first floor and accessible via the parking lot entrances on both Olympic Blvd. and Menlo Ave.